On March 23, the U.S. Food and Drug Administration announced the first-ever approval of a treatment for patients with a rare, aggressive form of skin cancer called Merkel cell carcinoma. The treatment, the immunotherapeutic avelumab (Bavencio), was approved based on data from the JAVELIN Merkel 200 phase II clinical trial. More extensive data from this clinical trial was presented by Howard L. Kaufman, MD, a surgical oncologist at Rutgers Cancer Institute of New Jersey in New Brunswick at the AACR Annual Meeting 2017 on Monday. Perhaps the biggest news from Kaufman was that the research team have calculated that responses last one year or longer for 74 percent of the responding patients, one of whom is Carrie Best, a school psychologist for special needs students in Dublin, Ohio. Carrie Best with her son, Dylan. She enrolled in a clinical trial of avelumab, which was recently approved by the U.S. Food and Drug Administration for patients with Merkel cell carcinoma. Best was diagnosed with cancer in May 2013, when her son was just 5 years old. Although the site of the original cancer could not be determined, over time it became clear that Merkel cell carcinoma was the most likely diagnosis. Within a year of her diagnosis, Best had run out of treatment options, but she was not willing to give up. Intensive research and perseverance led her to Kaufman, and she became the first person to receive avelumab through the JAVELIN Merkel 200 clinical trial in July 2014. Just six weeks later, after three treatments with the investigational immunotherapeutic, Best learned that her tumors were all gone. 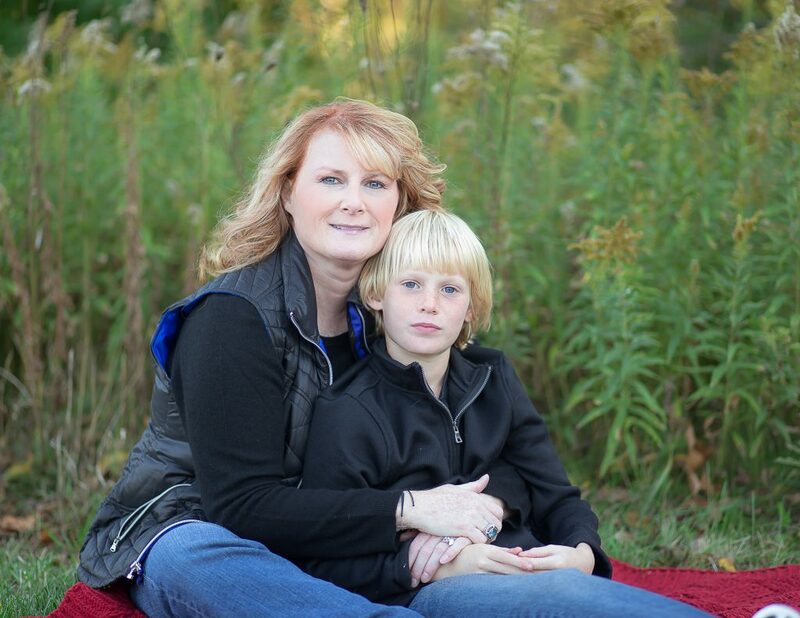 She continued to receive avelumab through the clinical trial for several months, but discontinued treatment in May 2015 when the research team felt confident that she no longer needed it. What is Merkel cell carcinoma and why treat it with avelumab? Merkel cell carcinoma, so called because it arises in cells in the top layer of the skin called Merkel cells, is a very aggressive form of skin cancer. It is also very rare, with only around 1,500 cases diagnosed each year in the United States, according to statistics from the National Institutes of Health. However, as with other forms of skin cancer, Merkel cell carcinoma incidence rates have been rising over the past few decades. Overall, the five-year relative survival rate for Merkel cell carcinoma is estimated to be 60 percent, but it varies widely by stage of diagnosis; the five-year relative survival rate for patients diagnosed with metastatic disease is about 20 percent. 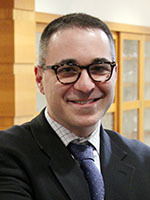 “Patients with metastatic Merkel cell carcinoma are usually treated with chemotherapy, but the cancer nearly always recurs within six months, at which point life expectancy is only about three to six months,” said Kaufman. Avelumab is a PD-L1–targeted immunotherapeutic. 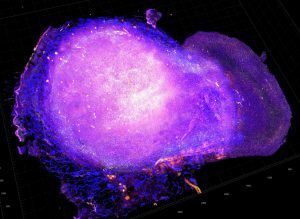 Shown here are cytotoxic T cells attacking a tumor from a mouse model for HER2-positive breast cancer after treatment with radiation and PD-L1 immune checkpoint blockade therapy. Image courtesy of National Cancer Institute. Kaufman explained that prior studies have shown that PD-L1 is found on tumor samples from nearly all patients with Merkel cell carcinoma. 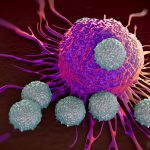 This suggested that Merkel cell carcinoma might be particularly sensitive to the burgeoning class of immunotherapeutics that target the PD-L1/PD-1 pathway, which slams the brakes on the natural cancer-fighting function of immune cells called T cells. By targeting PD-L1, in the case of avelumab and atezolizumab (Tecentriq), or PD-1, in the case of nivolumab (Opdivo) and pembrolizumab (Keytruda), these immunotherapeutics release the brake on T cells, allowing them to attack. The FDA approved avelumab for the treatment of both adults and pediatric patients age 12 or older with metastatic Merkel cell carcinoma, regardless of whether or not they had received chemotherapy for metastatic disease. According to the FDA, the approval was based on the fact that of the 88 patients enrolled by Kaufman and colleagues on the JAVELIN Merkel 200 clinical trial who received avelumab, 33 percent had complete or partial shrinkage of their tumors. The agency also noted that responses lasted for more than six months in 86 percent of responding patients and more than 12 months in 45 percent of responding patients. During his presentation, Kaufman provided additional data from the trial, showing that among the 29 patients to have responded to avelumab treatment after a median follow-up of 16.4 months, 10 had a complete response and 19 had a partial response. At the time of data cutoff, 21 of the responses were ongoing and the median duration of response had not been reached. He also said that the researchers have calculated that for 74 percent of patients who have a response, the response will last one year or longer. Can we expand treatment options for Merkel cell carcinoma? Avelumab is not the only immunotherapeutic targeting the PD-L1/PD-1 pathway to have yielded responses for a substantial proportion of patients with Merkel cell carcinoma. At last year’s AACR Annual Meeting, researchers presented data showing that 56 percent of patients with metastatic Merkel cell carcinoma who received pembrolizumab as initial treatment for metastatic disease through a phase II clinical trial had a complete or partial response. At this year’s meeting, early results from the CheckMate 358 clinical trial showed that 68 percent of patients with Merkel cell carcinoma had a complete or partial response following treatment with nivolumab.